Colin Hamilton, DC of Glenrothes PC, looks back on a successful 2017. As always, our Members Show brings a close to the spring/summer Pony Club season, and after a brief shower of rain as we were preparing for tack and turnout for our mini class, the sun or at least dry weather, was the order for the rest of the day. Lindores Cross Country has now become our adopted home, facilitating our weekly rallies on a Thursday evening, Summer League competitions, Camp, and Members show. As our club has put the foundations down at Lindores we have worked closely with Anna and the rest of the Black family to develop a great relationship which works for both parties. We are currently planning to enter our fourth season at Lindores which we are very happy about. After a winter of team jumping, indoor rally’s, quiz and the start of hunter trial season, eventually the clocks change providing enough daylight hours to commence the summer programme. We kick the season off with an on-foot rally for the kids and a parents meeting covering all the boring but essential information for the season ahead. Being a small club we alternate between flatwork and jumping each week with the odd specialist training added in for upcoming events. It’s great to see all the members back together again and how they are so welcoming of any new members who have joined no matter the age group. There is a real buzz in the air as the chatter of new ponies and upcoming competitions echoes around the farm. After a few weeks of rally’s, it is time for our first summer league. I am always impressed with how supportive our members are of each other even when there are lots of lovely rosettes to be won. The weather holds out for us and the kids do us proud, with their smart turnout and riding. Back to the rally’s and our thoughts are now turning to final preparations for camp. Camp provides lots of positive experiences, but the one I am going to mention is how even the youngest attendees grow in independence during the week, so much so we normally receive comments from shocked parents about how their children have changed. Not often kids are speechless but this year at camp we had Louisa Milne Home as a guest speaker and I think they were so in awe of her we couldn’t get any questions for Louisa, thanks for finding their mute button and for inspiring dreams for the future. The rest of the summer holidays were spent either at Area Qualifiers and Regional Champs for our more senior members, who all put in good performances in highly competitive environments, with the club bringing home rosettes every day in both competitions. We also had a team at Combined Training, although with no team placing, we had some very good individual performances that were rewarded with placings. Which brings us full circle to Members Show, there were some very closely fought classes with minimal marks between riders in tack and turnout and dressage, some very tight times in the Show Jumping with nice double clears and an extremely tough decision for our Working Hunter judge after some very confident riding. A massive thanks to everyone involved in our club, who all come together and help support all that we do for our members. We are looking forward to another great season at Lindores in 2018. 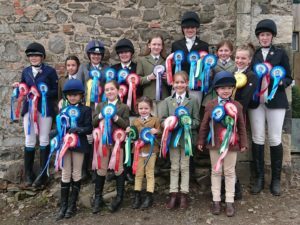 For more information on Glenrothes Pony Club Click here.